February 23, 2016  Posted by Manus C.
Chef Chuck’s Kuay Teaw Lui Suan, or Thai Garden Noodle Wrap, is the Thai version of the Vietnamese Spring roll. Thaithentic Recipes is an ongoing series of delicious Thai dishes created in real kitchens using fresh ingredients. Manus Chaorinuea is the founder of Thaithentic. He is an entrepreneur and food connoisseur. As a son of a Thai chef, he spends his time traveling, eating, and learning about different cultures. Being born and raised in New York City, he is an avid NY Rangers fan and plays goalie for an ice hockey team named Sriracha. February 9, 2016  Posted by Manus C.
Chef Chuck warms our hearts and our bellies with a delicious Thai Beet Soup, where the main ingredient is love. February 2, 2016  Posted by Manus C.
Right in time for Super Bowl Sunday, Chef Chuck makes a delicious vegetarian eggplant dip easy enough for you to try at home. January 25, 2016  Posted by Manus C.
Tuna fish doesn’t have to be plain or boring. Watch Chef Chuck turn tuna fish into a healthy and delightful treat, Yum Tuna Salad! January 20, 2016  Posted by Manus C.
Chef Chuck shows us how simple Larb is as he prepares Chicken Larb on Grilled Avocado topped with Quail Egg. January 12, 2016  Posted by Manus C.
Chef Chuck takes us through his Tom Yum Quinoa recipe. October 22, 2015  Posted by Manus C.
I am excited to introduce you to “The Thai-In,” a web series focused on travel, food, people, and how Thai food and culture tie-in to all of it. We will be exploring local foods and customs across the globe, while focusing on local eats and customs. As a NYC born and raised Thai-American, the food and cultures of the world have always been in my back yard. Having a chef for a father provided me with the perfect guide to learning about people and the joys of gastronomy. We had sit down dinners for most of my life and it was at those dinners where I learned that the true essence of food and dining is about people and sharing wonderful experiences with them. It became an addiction. All I wanted to do was travel, meet people, and eat. If there is one thing I have learned from all my travels, it is not to follow food and trends. Follow people, for they will lead you to great food. You will never go wrong following people as they are the greatest sources for new experiences. This is the very essence of the The Thai-In. I want to share my great experiences with all of you as I travel and eat my way through city by city, continent by continent, bite by bite, one meal and one conversation at a time. You really can’t really talk about food in Philly without mentioning Philly cheesesteaks as Philly is a very sandwich centric town. However, we found something even more local and has it roots right in Pennsylvania Dutch country. We’re talking about scrapple. Scrapple is made from the unused leftovers of pork grinded into gelatinous form, then breaded and fried. Scrapple was created with the idea that the entire animal should be used in butchery so that no food would be wasted. This way of thinking is very much in line with much of Thai culinary thinking so Chef Chuck concocted a unique creation. Behold, Thai Scrapple! Using only pork meat, pork liver, garlic, rice, and roasted rice power, Chef Chuck creates a uniquely Thai version of the Pennsylvania classic. The adventure continues each month and we hope you will enjoy these videos as much as we love making them. Let us know where you’d like us to go next on The Thai-In! June 2, 2015  Posted by Manus C.
I recently had the pleasure of interviewing Chef Bao of Baoburg in Williamsburg, NY. She is the executive chef and co-owner of Baoburg and is an upcoming Thaithentic Chef. As fate would have it, she was also doing a simultaneous interview with Thai DNA, a television show in Thailand showcasing Thai success stories across the globe. Eventually our interviews would merge and the interviewer would become the interviewee as I became part of Chef Bao’s story for Thai DNA. It was a fun and enriching experience for me as it serves as proof that topics like food and culture are always inevitably meant to become shared experiences. Check out the episode and see for yourself. Although my interview was in English, most of the show is in Thai. If there are parts you’d like to understand, don’t be afraid to ask us! Thaithentic Supper Club just got a lot HOTTER! May 11, 2015  Posted by Thaithentic . It’s Summer and it’s hot. Thai Tapas sounds like the perfect combination. 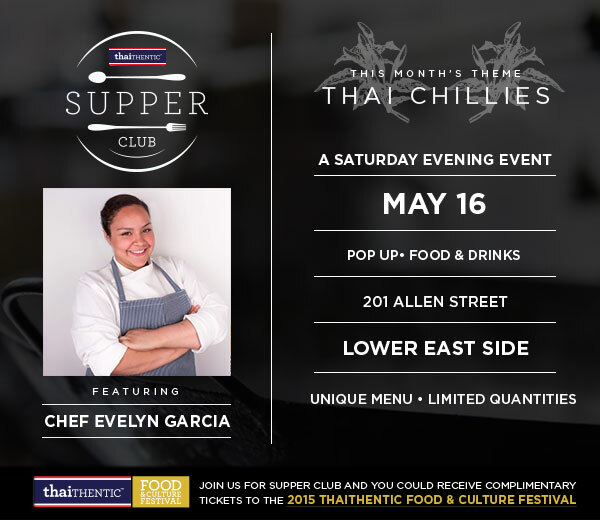 Come visit us at our PopUp Restaurant event on May 16th for a unique menu created by Chef Evelyn inspired by Thai Chillies. Follow us on @thaithenticNYC for more information! What is Thaithentic Supper Club? If you love Thai food you’ll love Thaithentic Supper Club. We bring you an interactive Thai dining experience where you’ll be immersed in Thai cuisine and culinary history. Our Thaithentic Chefs will prepare you a multicourse menu in a communal table setting designed to be intimate so that you’ll have the opportunity to engage with our chefs and experience their Thai cooking styles. Our goal is for you to leave our dinners feeling both satisfied and with a deeper understanding of Thai culinary trends and flavors. Who are the Thaithentic Chefs? We partner with private chefs and sous chefs to provide them with a location and a new audience to test out their Thai culinary vision. Who is the Thaithentic Chef for this Supper Club? Menu Theme: Our featured ingredient is THAI Chilies! Our team is comprised of marketers, creatives and developers with extensive backgrounds in advertising, event planning and web development. Through our combined experiences and commitment to our culture, we have the knowledge and passion to introduce new audiences to Thai cuisine and traditions. 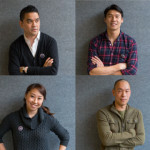 With our strong Thai heritage and deep-rooted connections with New York’s Thai community and Thailand, Thaithentic is the perfect ambassador to show the very best in Thai cuisine, creativity and culture. May 9, 2015  Posted by Pumiwat S.
Diners at Thaithentic Supper Club events are automatically entered to win a ticket to this year’s Thaithentic Food and Culture Festival. Here is the drawing from April’s Supper Club event. Congratulations to the lucky winner! Pumiwat Shutsharawan (North) is a partner at Thaithentic. He was born in Bangkok and raised in New York City and Norwalk, Connecticut. He studied at Babson College and worked in finance before starting his own ventures. Besides working with Thai chefs and restaurants (and eating!) 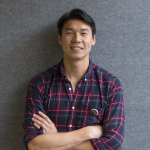 he enjoys working with food startups, watching the NY Giants and supporting the lowly Knicks. © 2015 Thaithentic™ is a Thai cultural brand and a trademark of Thaithentic LLC.